Combat rehearsals that replicate conditions provide valuable training for troops who have yet to experience the real war. The Army has spent millions of dollars during the past two years revamping its training facilities to turn them into realistic replicas of the battlefield. Fog and smoke are essential elements of realistic training scenarios. The most effective battlefield simulations are created with our Thermo-Fogger thermal fogging machines. This Thermo Fogger powerful enough for large areas. Operation of Model 3902 requires only one person. Oil based formulations are converted into a fog at the rate of about 175,000 cubic feet per minute. The unit has its own 15 gallon steel formulation tank equipped with remote manual controls permitting starting and stopping the fog from the cab of a vehicle. The two-stage heating system 1) prevents degradation of heat sensitive insecticides and 2) allows the creation of fine, billowy fog. MODEL 3902 is especially suited for military training, large parks, factories, golf courses and municipalities with mosquito abatement programs. Great for large special effect productions. Truck or cart mount. Specifications & more information on this model. View our Products page for more information the models we offer. 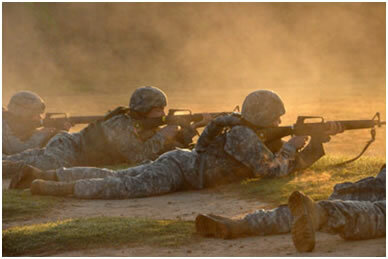 Call us today to learn more about Thermo-Fogger machines for Military Training Exercises.